The Petal Passion suite is very aptly named - it's so easy to fall in love with all of those beautiful products! This card features another of the Petal Passion Memories & More cards that I very quickly coloured with Stampin' Blends alcohol markers. The background paper is from the Petal Passion Designer Series Paper pack and they're mounted onto Sweet Sugarplum cardstock. 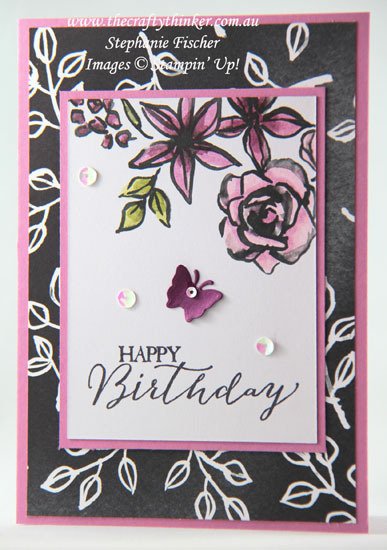 The greeting, stamped with Basic Black ink, is from the Butterfly Basics stamp set and the little Elegant Eggplant butterfly was cut with one of the dies in the Move Me set. A scattering of sequins and the card was finished in no time!